In Tuesday’s post on the outcomes for children and young people with SEND but no EHCP I concluded by drawing attention to the importance of the SEND Co-ordinator in taking responsibility for each child’s needs and each parent’s concern. 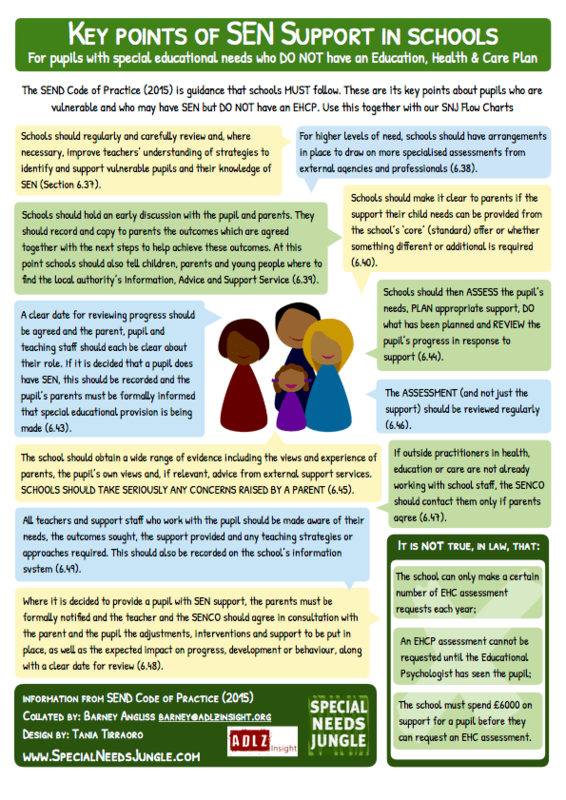 Today, we're giving you the key points for SEN Support, taken from the SEND Code of Practice. They're listed further down and come with a colourful infographic with the same information. But first, I'd like to talk a bit about the difficulties of the SENCo role, from my own experience. Whatever title the school chooses to use for this role (SENCo/SENDCo etc), it is a statutory requirement that each school should have such a co-ordinator and the role is very clearly specified in s49 of the SEND Regulations. In order to fully grasp why the SEND system still needs fixing, we need to understand why this key role within the SEND system is not working well. Firstly, since the SENCO role became essential in the 1990s, it has suffered a high quit-rate and there are may reasons for this. SENCOs may step down from the job because they are also teaching and their workload is overwhelming. Another possible reason is finding themselves caught in the crossfire between parents, headteachers and local authorities. Yet another is perhaps they are not given the training and professional support needed to have the kind of impact that’s expected of them. It's also possible they become frustrated by the lack of resources in the system, or even because their teaching colleagues swat them away like a fly every time they try to have a delicate conversation about why pupils with special needs require different approaches. I did the SENCo role for 14 years and, believe me, it’s a tough job. For this reason, schools frequently split the duties between several individuals to make it manageable. But this causes huge problems for parents, doesn’t help teachers at all, prevents school management from getting a complete picture and was never intended by the Children & Families Act. Also read: The role of the SENCo, what do you need to know? Another strategy which is now common among multi-academy trusts (MATs) is to employ one SENCO for many schools. This means that they can afford to appoint a full-time specialist, someone with real experience and qualifications for the job – but they may operate more like an executive and may only be available in your locality once a month. As for the training… there are ways around that. If a school decides not to ensure that their SENCO holds the “compulsory” national SENCO award, there isn’t much to deter them. Many SENCOs are on ‘temporary’ contracts for this reason: the national SENCO award is only compulsory if the SENCO is in post for three years or longer and was appointed after 2009. The result is that, in many schools, the SENCO role changes hands every couple of years and their knowledge of children and families is therefore minimal, not to mention their understanding of professional assessment reports. So, from the SENCO perspective, the system is well and truly broken; and that, dear parent, is the professional on whom you are supposed to rely. The school has a duty (s49 of the Regulations and s67(2) of the Children & Families Act) to monitor the effectiveness of their SENCO. Ask your school how they do that and ask to see any minutes of Governors’ meetings when SEND outcomes were reviewed. Schools should regularly and carefully review and, where necessary, improve teachers’ understanding of strategies to identify and support vulnerable pupils and their knowledge of SEN (Section 6.37). For higher levels of need, schools should have arrangements in place to draw on more specialised assessments from external agencies and professionals (6.38). Schools should hold an early discussion with the pupil and parents. They should record and copy to parents the outcomes which are agreed together with the next steps to help achieve these outcomes. At this point schools should also tell children, parents and young people where to find the local authority’s Information, Advice and Support Service (6.39). Schools should make it clear to parents whether the support their child needs can be provided from the school’s ‘core’ (standard) offer or whether something different or additional is required (6.40). A clear date for reviewing progress should be agreed and the parent, pupil and teaching staff should each be clear about their role. If it is decided that a pupil does have SEN, this should be recorded and the pupil’s parents must be formally informed that special educational provision is being made (6.43). Schools should then Assess the pupil’s needs, Plan appropriate support, Do what has been planned and Review the pupil’s progress in response to support (6.44). The school should obtain a wide range of evidence including the views and experience of parents, the pupil’s own views and, if relevant, advice from external support services. Schools should take seriously any concerns raised by a parent (6.45). The assessment (and not just the support) should be reviewed regularly (6.46). Where outside professionals in education, health or care are not already working with school staff the SENCO should contact them only if the parents agree (6.47). Where it is decided to provide a pupil with SEN support, the parents must be formally notified and the teacher and the SENCO should agree in consultation with the parent and the pupil the adjustments, interventions and support to be put in place, as well as the expected impact on progress, development or behaviour, along with a clear date for review (6.48). All teachers and support staff who work with the pupil should be made aware of their needs, the outcomes sought, the support provided and any teaching strategies or approaches that are required. This should also be recorded on the school’s information system (6.49). The school must spend £6000 on support for a pupil before they can request an EHC assessment. All that above, in an image. It's FREE for you to use, download and share but please ensure you credit Special Needs Jungle. The PDF download link for printing it out is at the bottom. Copyright: Special Needs Jungle Ltd. Non-commercial reuse permitted with credit. For commercial usage, please contact SNJ.